The signature Terra colours were flown by chief executive of the Terra Group Andrew Mallalieu and his co-driver Geoffrey Goddard in their N10 Subaru Impreza, while Rob Swann and co-driver Darren Garrod from the United Kindom were behind the wheel of the Blue Sky Luxury Subaru Impreza S12B. Both teams posted stellar performances overall and within their respective groups, securing top twenty finishes. 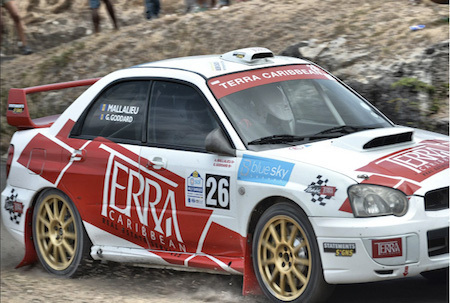 The visiting UK-based duo of Swann and Garrod, who have now become a staple on the Rally Barbados register, placed a convincing second both in the WRC-1 class and the overall standings. Speaking after the grueling weekend, Swann lauded the event and expressed his delight of participating once again despite the rigors of the weekend. “It's been a tough three days but we've really enjoyed it. We had some issues Friday night that dropped us a bit of time, but we got over them. We've had a really good time in the car. Some of the stage times have been really fantastic. We'll be back next year… for the win!" Swann added. Also twinning in their Subaru-badged machine, local rally veteran Mallalieu and co-driver Goddard put on a bold show in conquering changes to the usual rally stage routes that included longer stages as well as night-time stages and alteration to old favourites. When the dust settled at the end of the rally, Mallalieu and Goddard were a secure second in the Group N category and sixteenth overall. Overall, the man of the moment was Jamaica’s Jeffrey Panton and co-driver Michael Fennell Jr., who powered through a late-game scare to take their Ford Focus WRC06 to a three-peat victory over the competition. Roger Duckworth of the UK, also in a Subaru Impreza, placed third behind Swann, making it only the fourth occasion of the rally’s almost three-decade history where a Barbadian driver was not a podium finisher. 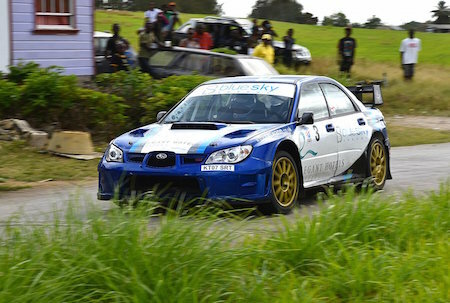 Rally Barbados is the most anticipated motorsports event on the Rally Club’s calendar. With an alumni list of names such as Toni Gardemeister (Finland), Kris Meeke (UK), Simon Jean-Joseph (France) and Paul Bird (UK), the event continues to attract some of the most popular drivers and most prolific names and brands within the motorsports fraternity to the island.